People’s Palace Projects and the English and Drama Department at Queen Mary University of London are honoured to invite you for this year’s Drama Annual Lecture on the 21st June – with talk by the ever wonderful Jenny Sealey – followed by a drinks reception celebrating PPP’s 20th Anniversary. 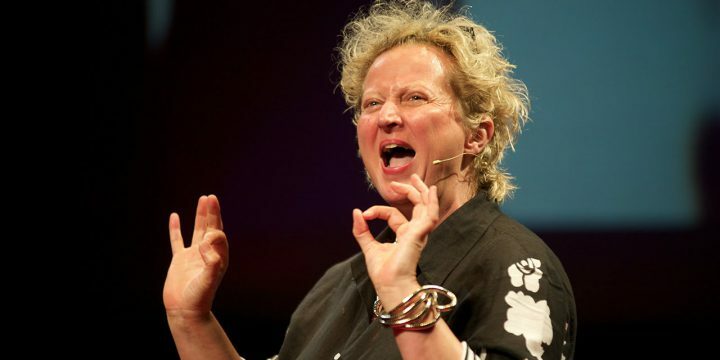 The lecture will be British Sign Language interpreted and draws upon Jenny Sealey’s experience as artistic director of Graeae Theatre Company. Co-director of the Paralympic opening ceremony for London 2012, Jenny will be discussing her international experiences as a theatre director as well as over fifteen years at the head of one of the UK’s flagship theatre companies to explore issues of access, aesthetics and social justice in theatre and performance. This lecture will be British Sign Language interpreted. Jenny Sealey has been the Artistic Director of Graeae Theatre Company since 1997. She has pioneered a new theatrical language and aesthetics of artistic access experimenting with bilingual British Sign Language and English, pre-recorded British Sign Language, creative captioning, and in ear/ live audio description methods. She works nationally and internationally to share and continue to develop the accessible ethos within performance and use this form a global cohort of Deaf and disabled artists to challenge and change the perception of possibility and push for a cultural shift and an equal playing field. Her current international work includes working with Crescer e Viver re setting up circus training for Deaf and disabled people for their Paralympic Opening Ceremony and Cultural Olympiad; Reasons to be Cheerful in Mexico and new projects starting in Sri Lanka and Japan. She has recently returned from doing Romeo and Juliet with an all Deaf and disabled team for National Theatre of Dhaka which is the first time in history disabled people have been on a main stage in Bangladesh. In 2009, she was awarded an MBE in the Queen’s Honours and became an Artistic Advisor for Unlimited 2012 Festival. Jenny co-directed the London 2012 Paralympic Opening Ceremony alongside Bradley Hemmings (GDIF). She also won the Liberty Human Rights Arts Award and was named on the Time Out London and Hospital Club h.Club100 2012 list of the most influential people in the creative industries. Since 2012 Jenny has been awarded an honorary doctorate degree in Drama from Royal Conservatoire of Scotland, in Performing Arts from Middlesex University and a Fellowship at Central School of Speech and Drama and Rose Bruford College.